Although landmark studies in the 1960s showed that THC is the predominant psychoactive component in cannabis, there is now ample evidence that its medicinal/psychoactive properties are modified by a class of organic compounds called terpenes. At Dr. Paul's we believe terpenes underlie many of the discrete biological effects induced by cannabis, and we are actively performing experiments to "crack the code" that will tell us how different terpene combinations elicit their unique biological responses. When you walk into a room and instantly recognize the smell of bacon, how does your brain know this? Aromatic molecules in bacon hit receptors on neurons in your nose that are wired to your brain centers that recognize these molecules and transduce signals that trigger you to think "yum" and cause your stomach to start grumbling. The mechanism of how cannabis works is roughly similar. As cannabis, or a concentrate of cannabis, is vaporized THC and terpenes become volatile, distribute very quickly through your body and engage protein receptors on neurons and immune cells in your body. While it is widely accepted that different cannabis strains induce unique biological responses (e.g. an "up" strain vs. a "couch-lock" strain), there is currently little real science to explain these effects. This is the void in knowledge that Dr. Paul's seeks to fill. Although tetrahydrocannabinol (THC) is the major psychoactive ingredient in cannnabis, extracts from the plant have hundreds of additional compounds that contribute to its medical benefits. A large amount of scientific studies indicate terpenes synergize with THC and other cannabinoids to increase its therapeutic index, and this is known as the entourage effect. At Dr. Paul's, we understand and take advantage of the entourage effect to create unique products with distinct terpene profiles that are designed to elicit specific medical benefits supported by independently published scientific studies. β-Caryophyllene smells like the hops used to flavor beer. Scientific studies show this terpene may decrease pain, ulcers, anxiety and depression in animal models and is the only terpene known to interact with the body’s endocannabinoid system (CB2). It produces anti-inflammatory and analgesic effects. β-Caryophyllene is found in several edible plants. Among those are a variety of spices, such as black pepper, cinnamon and cloves, and herbs, such as basil, rosemary, oregano and hops. Humulene is found in hops, cloves, basil and cannabis sativa. Scientific studies show this terpene may decrease inflammation. This terpene smells a bit like cardamom and cloves. Scientific studies show this terpene maybe neuroprotective, anti-inflammatory and also beneficial for pain. β-Myrcene is a prevalent terpene and is found in most varieties of cannabis. High concentrations of β-myrcene have been shown to induce sedation. β-Myrcene is also present in thyme, hops, lemongrass, and citrus, and is used in aromatherapy. Linalool has a floral scent and is also found in lavender. Scientific studies show this terpene may decrease anxiety, depression, chronic pain, neurodegeneration and inflammation. High concentrations of linalool have been shown to induce sedation. Limonene smells like citrus. 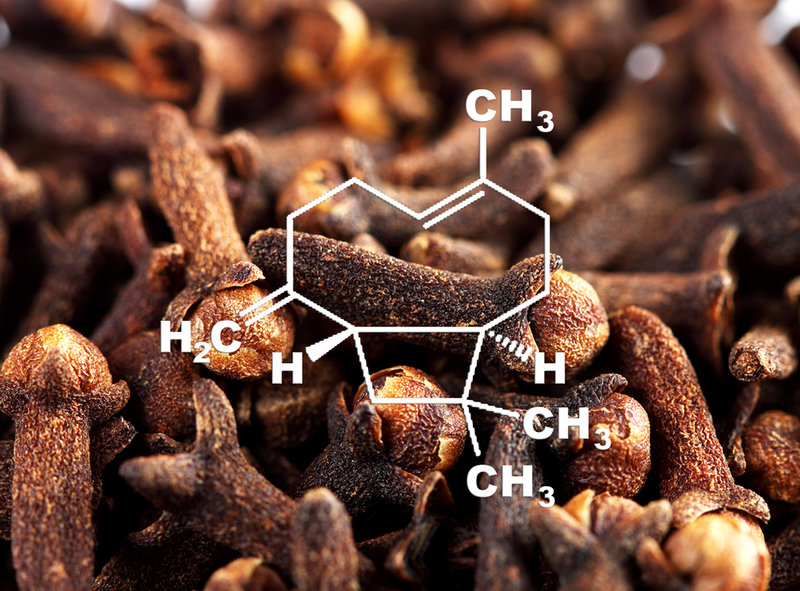 Scientific studies show this terpene may decrease anxiety, depression, pain, inflammation, and cancer, in animals and in some published studies in humans. Geraniol has a floral scent like roses. Scientific studies show this terpene may decrease depression, pain, inflammation, cancer, atherosclerosis and neurodegeneration. α-Pinene is the most common naturally occurring terpenoid and has a pine scent and helps to give cannabis its distinct aroma. Scientific studies show it may decrease anxiety, pain, ulcers, inflammation and cancer. This terpene is produced naturally by a variety of plants and whose aroma of fresh pine needles gives it its name. In addition to being found in pine trees, pinene is produced by many herbs, such as basil, parsley and dill. p-Cymene is said to contain a musty scent and is also found naturally in thyme and cumin. Scientific studies show this terpene may decrease anxiety and is neuroprotective. This terpene may also reduce inflammation.